Today marks the 24th anniversary of the first airing of X-MEN:TAS on the Fox Television Network on October 31st, 1992. (It is also Halloween, and would have been my late father’s 90th birthday, but let’s stick to X-MEN today.) As most of you know, Fox had hoped to get us on the air at the beginning of the 1992/93 TV season in early September. But a late start getting the project authorized (February, ’92) and creative and production challenges meant that not enough episodes were in good enough shape to show audiences by September. Fox Kids president Margaret Loesch had a tough decision to make: show substandard episodes on schedule, and probably have to repeat them while waiting for others to complete, or delay the entire series until January for a “mid-season” start. Delay meant showing repeats of low-rated old series in the X-MEN time slot for 17 weeks — angering televison station owners and their supporting advertisers, all of whom would lose money for those four months along with Fox. Well, Margaret stood by her guns and insisted that X-MEN:TAS wouldn’t be shown until it was right. History has proved her decision wise, but at the time it could have cost her her job. As we anxiously waited for January, Margaret had the brilliant idea of a “sneak preview” of the show, to be shown in the early evening on Halloween. This airing of the now-better-animated (still not final) series pilot (“Night of the Sentinels”) got people excited. Ten weeks later, when “Sentinels” was right and we had enough episodes properly completed and polished, X-MEN:TAS had its official January premiere. The impatient audiences, their expectations built up by weeks of waiting, were huge. We started at the top and never looked back. Out of adversity — and a brave decision — came success. @XMENTAS hits 3000 followers on Twitter! Thanks again! It took a couple of months for our Twitter site (@xmentas) to get to 1000 followers on August 3rd. Then it took another 44 days to get to 2000 on September 16th. Now it is the 28th of October, it’s 42 days later, and we just hit 3000! Rogue is so excited she’s stomping a dinosaur (courtesy of X-MEN:TAS producer/designer Will Meugniot). If you haven’t yet, please join us as Twitter followers. 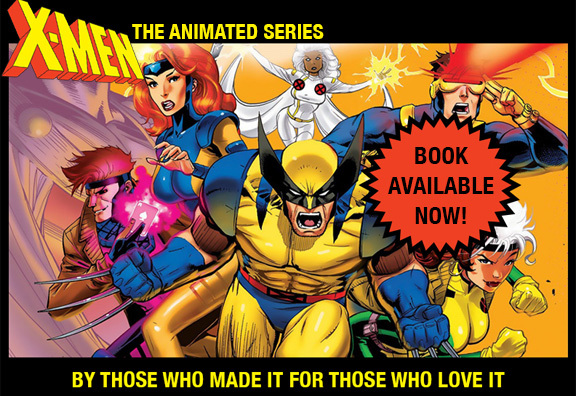 We who contribute to the website appreciate your keeping in touch and staying part of our X-MEN:TAS family. We will do everything we can to keep updating xmentas.com and responding to your tweets on Twitter. Sacrifice is central to being a hero, super or otherwise. Sadly, much of Hollywood has given up on this. All endings, it seems, must be happy. In classic storytelling, the great heroes died or at least suffered great loss. In X-MEN:TAS we had our team face personal sacrifice whenever we could. The first story climaxed with Morph sacrificing his life for his closest friend, Wolverine (see below). In the much later “One Man’s Worth,” Storm and Wolverine sacrifice their undying love to save someone they have never met in this timeline (Charles Xavier). One of the greatest moments in the history of sacrifice in storytelling was the final shot of the movie “The Searchers” (1956). John Wayne’s character has just given five years of his life, struggling, searching for and rescuing his niece. He brings her back and heals the pioneer family that had lost her. One by one the happy family go inside the house, leaving the heroic uncle standing alone in the doorway. The words “Ride away…” are sung on the sound track. John Wayne looks into the house for a moment, seeing something he can never quite be part of, then walks off alone. He did what he had to do; he sacrificed. When I meet people who loved X-MEN:TAS, nearly every one says: “You had me when you killed Morph.” This show, they decided, was different. Mark Edens and I, who made this initial choice, just took it for granted that personal sacrifice was at the center of what it means to be a hero. I guess we’re just old-fashioned. Think about it. You work on a series for five years — even one as fun as X-MEN:TAS — and drawing the same look for the same characters could get old. So imagine the fun when word comes down from the writers that we’re doing time-travel or an “alternate timeline” episode, either of which requiring new looks for the characters. Below are a couple of alternative designs for Rogue and Scott. Below those are a couple of images from one of my favorite epsisodes, “One Man’s Worth.” The first, a modern-day, idyllic moment bewteen Storm and Wolverine (having a picnic!) suddenly switches to an alternative timeline (created by evil time-travellers) where they are fighting for their lives in dystopic, miserable world. Alt-Storm is designed so much tougher, so punk, that you know her life is diferent just by looking at her. After months of drawing “normal” Storm, it must have been fun to be asked to re-imagine her. The distinctive looks sure worked for us in the story. Below is the brilliant early poster for the movie “Logan” that will premiere four-and-a-half months from now. The simple image of Wolverine’s battered, clawed hand holding that of an unseen child is perfect. We need to see our heroes fight; we need to see them struggle to prove themselves worthy. Both are exhilarating. But “struggle” to what end, for what purpose. The second hand answers that question. In X-MEN:TAS, as in all super-hero series, personal realtionships, loves, and loyalties are as important as spectacle and victories. Sometimes creators forget the importance of one or the other. We tried never to make that mistake. We weren’t always 100% successful, but we tried. We always wanted to show both hands in the picture. I don’t trust movie trailers. I’ve been tricked too many times by 90 seconds of images, cleverly cut together, that hide/sell a mediocre or bad movie. Telling a compelling 100-minute story is hard, and most fail. I just saw the trailer for the new Wolverine movie “Logan.” It had the great Johnny Cash singing “Hurt” under it. It showed a bruised, aging, weary Logan, struggling with personal loss. It looks like an intense, personal movie with only the minimum of required superhero action. It looks like a tough movie that I could love. I am hoping that this time my fears are unfounded. The word is that in 2017, in the 18th year of the X-Men movie franchise (2000-2017), this will be Hugh Jackman’s final performance as one of pop culture’s greatest characters. Logan meant a lot to us as we worked to build the stories for the 76 X-MEN:TAS episodes. He was so raw, so much the beating heart of the team, that we had to struggle not to over-use him. The movies could have screwed up Wolverine’s character . In large part thanks to Hugh Jackman, they got it right. (Few remember he wasn’t even the first choice for the role.) So I’m looking forward to next March when we get a chance to say goodbye to Jackman’s Logan. I’m hoping that he gets his farewell in a great movie.